If you’ve been keeping fish for a while and are looking for a fun new project, trying your hand at breeding might be a good option. You’ll get to see the parents’ breeding behavior and have the satisfaction of watching the entire process from egg to full-grown fish. Choose your fish wisely, though – some species don’t reproduce easily in the aquarium which can be quite frustrating for a beginner. If you’re looking for a good species to start with, keep reading for a list of 7 easy fish to breed that even beginners can be succesful with. When it comes to easy fish to breed, livebearers are probably the first thing any aquarist thinks of. 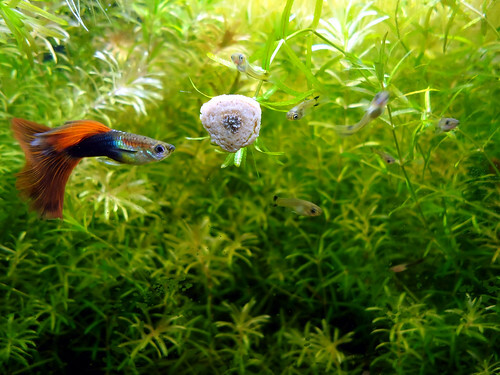 Guppies (Poecilia reticulata), swordtails (Xiphophorus hellerii), platies (Xiphophorus maculatus), least killifish (Heterandria formosa) and mollies (Poecilia sphenops) should all breed readily as long as their needs are met. In fact, most aquarists struggle to stop them from breeding! They are also very colorful, not too difficult to keep and very active. All this makes livebearers a super easy breeding project option (especially for kids) but keep in mind that you will inevitably end up with a lot of fish. To prevent your tank from becoming overcrowded be sure to have a plan B, such as an aquarium store willing to take the fry. Try looking into breeding a specific line of color or finnage for an extra challenge and to possibly sell your fish at a higher price. You can find a full guppy caresheet here and a full swordtail caresheet here. 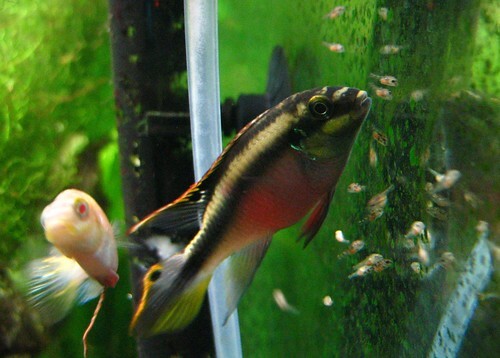 Kribensis is one of the most popular egg-laying fish for breeding projects. These cichlids are very colorful, display interesting behavior and breed very easily in the aquarium. They can be kept and bred in community tanks, but keep in mind they do become very territorial when breeding and guarding their eggs or fry. In smaller tanks (at least 20 gallons / 78 L) it’s best to stick to a single pair and possibly a few small schooling fish to avoid aggression. To breed your kribensis, provide plenty of caves and other suitable egg laying locations; after all, these are cave breeders. When the female is ready to breed her belly will turn an intense cherry-red color and she will lead the male to a cave she deems suitable to lay her eggs. After this, the female will remain in the cave to care for the eggs until the fry hatch. When the fry start swimming and exit the cave they will be intensely guarded by the parents until they are large enough to fend for themselves. All in all, a very interesting process to follow! They’re not exactly fish, but dwarf shrimp like the ever-popular cherry shrimp are actually one of the best and easiest choices for beginners. They don’t require large tanks (5 gallons / 19L is great to start with), aren’t fussy about water values and breed very easily. Although their numbers can quickly rise their bioload is very low, which means you won’t be scrambling to rehome them. If you do have to get rid of a few it’s not difficult to find someone willing to take them, as they are very popular in the aquarium hobby. To breed your cherry shrimp make sure your tank is fully cycled and has plenty of hiding places in the form of plants and shrimp flats. Introduce at least 5-10 shrimp (the females are larger than the males), feed a high quality shrimp food and they will take it from there. You should soon start seeing the females carry yellow or greenish eggs, which eventually hatch into tiny copies of the adults. Easy! You can breed selectively for a deep red color or just let the shrimp do their thing. If you don’t like red, these dwarf shrimp are also available in yellow and blue. You can find a full cherry shrimp caresheet here. White cloud mountain minnows are small, colorful schooling fish naturally found in cool waters at high elevations. They are easy to care for, display interesting breeding behavior and should breed easily if all their needs are met. Your main aquarium should be at least around 15 gallons / 57 L (long) and kept at relatively low temperatures; room temperature should work fine in most cases. 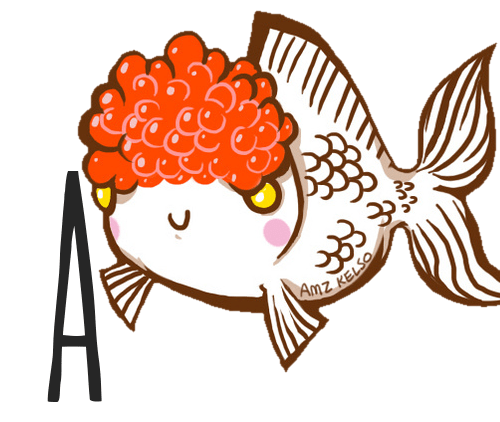 Get a school of at least 8 fish, preferably more. You’ll soon start seeing the males displaying their colorful fins and sparring with any rival that comes too close. 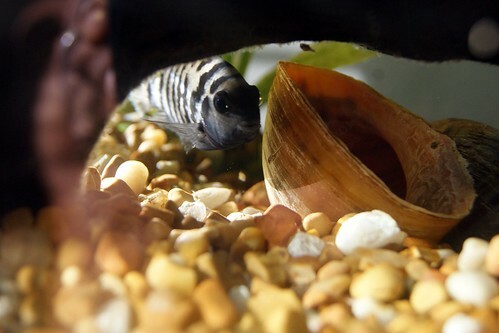 Most dedicated breeders keep a second tank on hand for breeding as these fish do tend to eat their own eggs, but I suspect you should be able to keep some fry alive in a main tank with plenty of fine-leaved plants such as hornwort. You can find a full white cloud mountain minnow caresheet here. If you’re looking for an interesting breeding project that’s a little more out of the box, the wondrous world of killifish might be your thing. These colorful fish are perfectly adapted to life in areas that can fully dry out during the dry season: their eggs can withstand a period of drought and some have a life cycle of only a single year. The steel-blue killifish has a longer lifespan and is not too difficult to keep or breed, which makes it a great option for beginning breeders. To keep your steel-blue killifish happy and healthy, a single-species setup usually works best. A tank of at least 10 gallons (38L) should be fine for a breeding pair, although bigger is better. If you’re not specifically looking to produce as much fry as possible you can heavily plant the tank, otherwise keeping it relatively bare with just some spawning mops might work better. Also keep a lid on the aquarium at all times, as these fish are skilled jumpers! The fry are usually raised in a separate container with plenty of Java moss to prevent the parents from eating them. Convict cichlids are probably one of the easiest cichlids to breed. Unfortunately, their popularity means they often end up in less than ideal setups: they can be quite aggressive and are not community fish. A single-species aquarium of at least around 30 gallons (113L) is probably your best option if you’re interested in keeping these feisty cichlids. To breed convict cichlids fish all you usually have to do is place a male and female together and supply plenty of hides that can be used to lay eggs in. Clay pots are a cheap option that should work well. Feed a varied diet and keep the tank clean and eggs should appear in one of the pots or caves after a short courting period. The female will tend to the eggs and fry while the male aggressively defends the territory and attacks anything that comes too close. Corydoras catfish come in many shapes and sizes and almost every aquarist has kept them at some point. One of the most popular Corydoras species is the bronze Corydoras, which is appreciated for its easy care and cheerful behavior. It’s also very easy to breed, which makes it a perfect option for the beginning ornamental fish breeder. Keep your bronze Corydoras in an aquarium of at least 20 gallons (76 L) with plenty of floor space and a sand substrate. Provide cover in the form of plants and driftwood, keep the tank very clean and feed a varied diet to make sure your fish are healthy. Pregnant females are easy to recognize, as they will grow very round. To trigger spawning, do a large water change with slightly cooler water to simulate the rainy season. If all goes well eggs should soon appear; you can move these to a separate tank to prevent the parents from eating them. You can find a full bronze Corydoras caresheet here. If you have any more questions about breeding aquarium fish or if you want to share your own experiences and tips, don’t hesitate to leave a comment below! I also think this wonderful information, going past livebearers well. I would add the native, to the SE USA, least killifish, certainly as prolific as all the others and a lively fish that’s fun as well. A tiny livebearer, despite the common name. Great article, my favourite fish that I’m keeping is a duo of male African Knifefish. Practically impossible to breed in an aquarium, wrote an article on it actually.